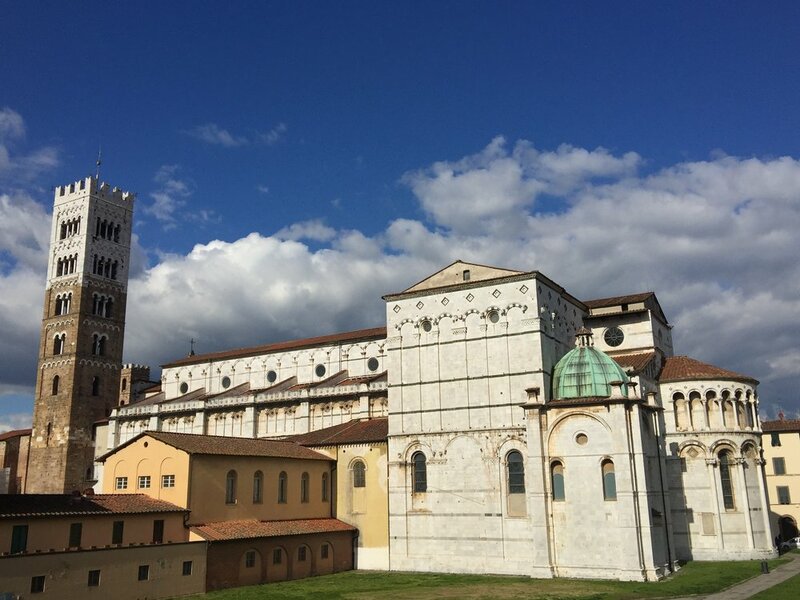 The medieval walled town of Lucca is one of Tuscany’s most famous and most visited locations. Here is our “Little Roads” list of our favorite sights in Lucca, as well as a choice restaurant and lodging option. The walls surrounding the town were initially created for its defense. 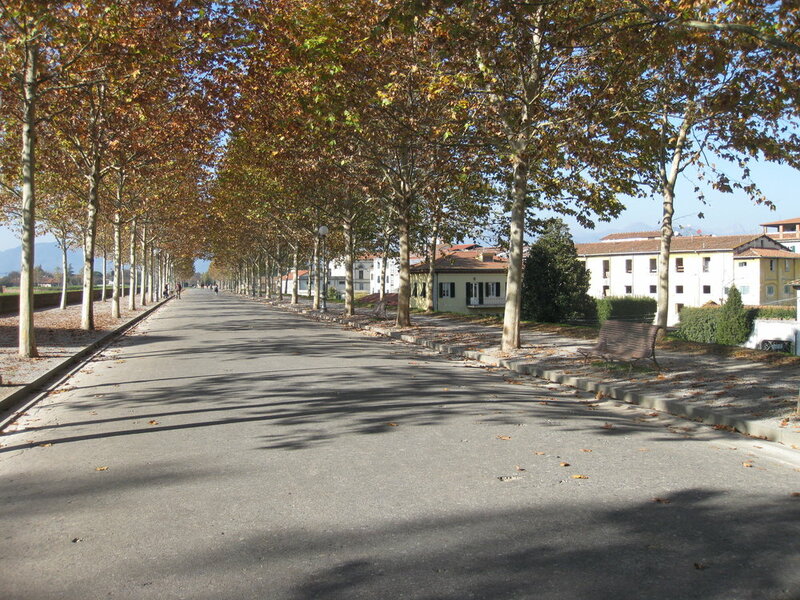 As they were never assailed in battle, the walls became beautiful tree-lined public walkways and bikeways. Visitors can rent a bike, which can be done quite cheaply by the hour at a variety of bike vendors. The quality of the bikes is not high but they are fine for just checking out the town wall perimeter, which is about 4 kilometers in length and an easy ride. Plan to spend about an hour or more riding around the town wall, stopping to take pictures, and seeing what's in town that you would like to visit. You can ride the bikes through town also, but you have to contend with tight spaces shared with pedestrians. Probably the most famous open space in Lucca, this large piazza is laid out in an oval shape, a result of its origins as a Roman amphitheater that was in use during the 2nd century BC. Today the buildings that surround the piazza are home to shops, restaurants and residences. Apartments face the cafes on the Piazza Anfiteatro. OK, not murals exactly. 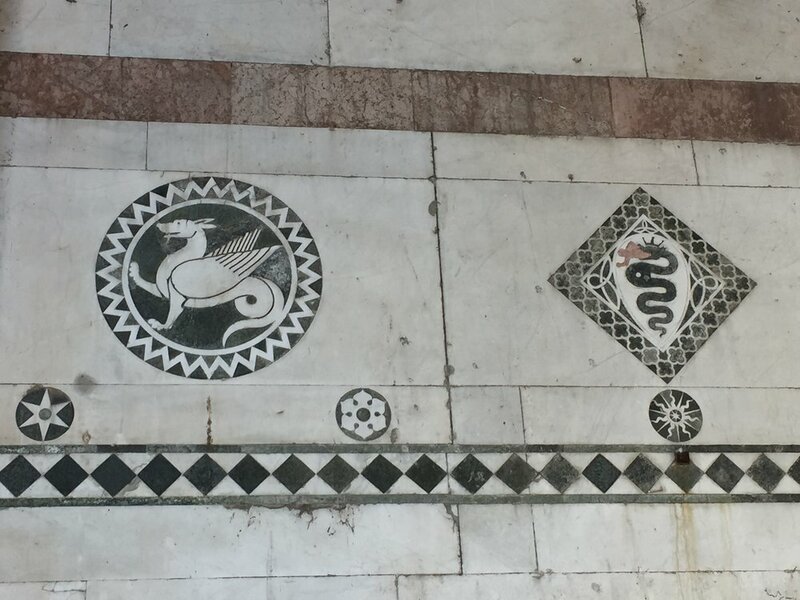 A few artists have painted or drawn “mini-murals” on walls all over Lucca. We had fun exploring the town and finding the little works of public art; we then turned it in to a photo series for our blog. Searching out the murals makes for a good excuse to spend a few hours exploring all the little side streets in this walled medieval town. A friend (a professional baker who lived in the area) turned us on to this bakery. She told us not to miss this place, and she was spot on! We stopped in to buy a little tray of cookies and pastries, choosing whatever drew our attention in the case. Don’t miss the “frittelline di riso” and the mini cream puffs, which come with multiple choices of fillings, like chocolate, vanilla, and hazelnut. A great cellist - especially since his bow defied physics! If you are looking for a special gift for yourself or a friend, Tommasi is a place worth checking out. 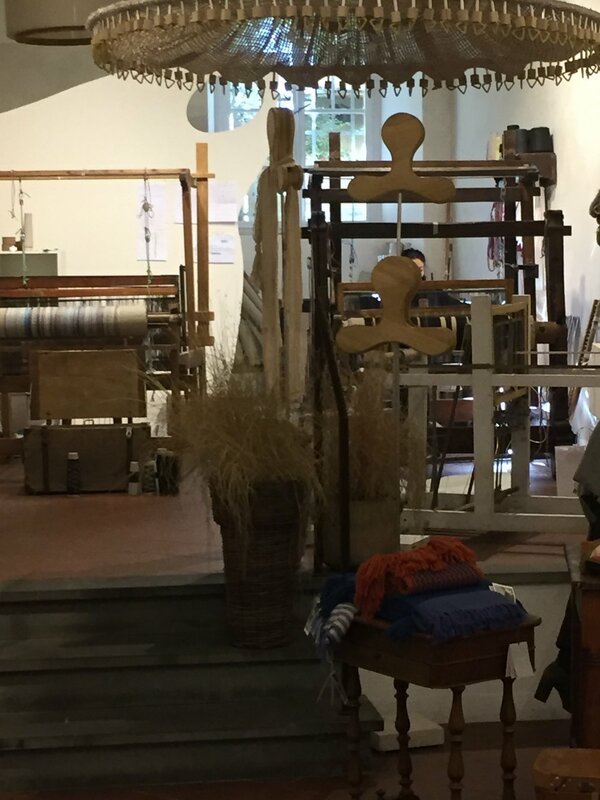 Everything on sale in the shop is made right there, on huge looms that sit in the back of the store. Women work the looms during the shop’s hours, so you can watch the original designs being made using this traditional technology. The Via del Fosso (literally, “Street of the Ditch”) runs along a single narrow, shallow canal running through a part of the city that used to be a row of silk makers’ shops. The brisk-moving waters of the run provided power to these silk producers, helping Lucca become one of the prime sources of fine silk goods centuries ago. Though it’s in one of the most overlooked parts of the city, it is one of Lucca’s most picturesque streets. This pic was our best one, even with that old man walking in the scene. On one of the main streets in Lucca stands the centuries-old family business of Carli Jewelers. Their work is beautiful, ornate, and - naturally - the product of twelve generations of jewelry makers. The shopkeepers place ornate antique wooden cases outside the shop on the street to display their wares. Inside, the walls arch to the elaborately painted ceiling. Glass cases house pieces of jewelry and silver sets that are 200 years old or more, making the place effectively a museum and antique shop as well. This food shop has been run by the same family for several generations. Here’s where to find the best in local products - pastas and grains and nuts, jams and sauces, flour, dried beans and lentils and mushrooms, and of course lots of local wine, oil and liquori to choose from. If you’re staying for a few days and want to stock your kitchen, or if you just want a few things to bring back with you to enjoy at home later, this shop is a perfect place to stop. Visitors often overlook this 14th-century church on the east edge of town, though it is an important stop on the Via Francigena pilgrimage route that crosses the country. Attached to it are the cloisters of a monastery that house medieval tombs and (of course) a statue of Saint Francis. Not just a huge church with a stunning facade, San Michele oversees a wide-open and busy piazza in the center of town, where townspeople (and their dogs) gather to socialize and share news. Puccini fans might want to grab a coffee or cocktail at the bar across from the church, Café Turandot. Parts of Lucca’s Duomo (the town’s main cathedral) date as far back as the 11th century; much of it was completed in the 14th century. The adjacent bell tower was already in place, so the cathedral facade needed to be “scrunched” to fit into the space. The church is incredibly ornate, inside and out - frescoes, carvings, and sculptures adorn almost every square inch of the building. Established in honor of an Irish saint who came to preach in Lucca in the 6th century, this church is most remarkable for its facade, which is covered with a huge golden mosaic depicting Christ and the Apostles. It also houses a huge marble baptismal font from the 12th century, into which are carved Biblical scenes. We love Osteria Baralla, located just outside the Amphitheatre. Serving traditional Lucchese food since 1860, this beautiful restaurant occupies the space that used to be the stables and coach-house of a large villa. The setting is so charming, and the family that runs the place is very welcoming. If you are interested in trying traditional food from Lucca this is the place to do it. 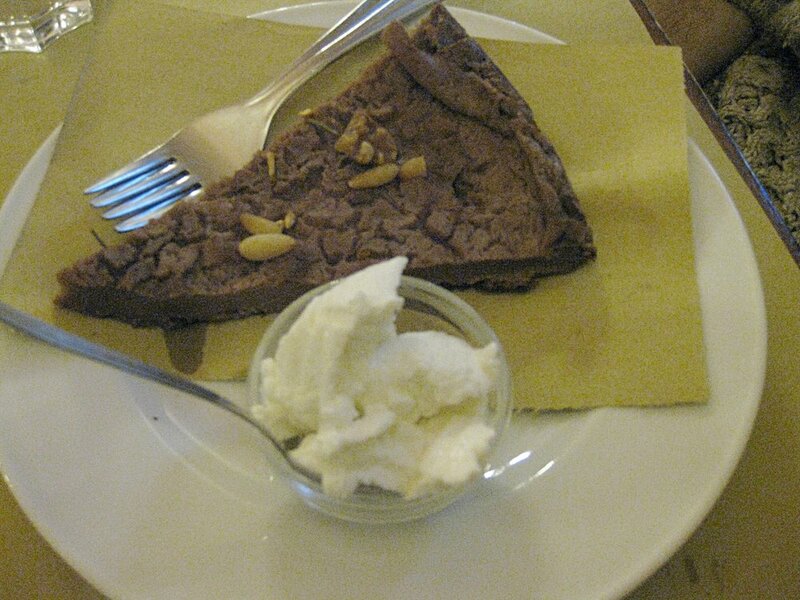 They serve a locally famous cake, “castagnaccio”, which is a made with chestnut flour. It is not sweet at all, and is served with a scoop of unsweetened ricotta. The cake may not be what most people would consider a dessert, but it is like tasting a little piece of history. It doesn't get more traditional than that. Dinner on the tower roof, in a pano shot. Do you like this approach to travel? Do you want to explore towns like this? Little Roads can create an immersive and authentic small-town itinerary for you - let us plan your trip! Yes! Please Plan My Trip!